What was begun as a site focused on Spangs in the United States has expanded to include all Spangs. It is acknowledged that the Spangs from the Netherlands, Denmark and Sweden are not well represented, in part because there is uncertainty if they are Spangs or if their names were shortened. My own research began over a single comment from my father 70 years ago which might have resulted in my not existing! After a very unfortunate event, my father claimed, to his future in-laws, "of course, all Spangs are related." This innocent remark has led me on a quest that has spanned the last 60 years. This sort of research was slow and tedious before the computer and the internet but, since then, has taken on a life of its own. This site somewhat arbitrarily breaks down Spangs by early emigrants. This is because it is easier to keep separate files on different 'families' or 'branches' until they are connected. Please try to let me know the family names you are interested in as that will speed up my search. 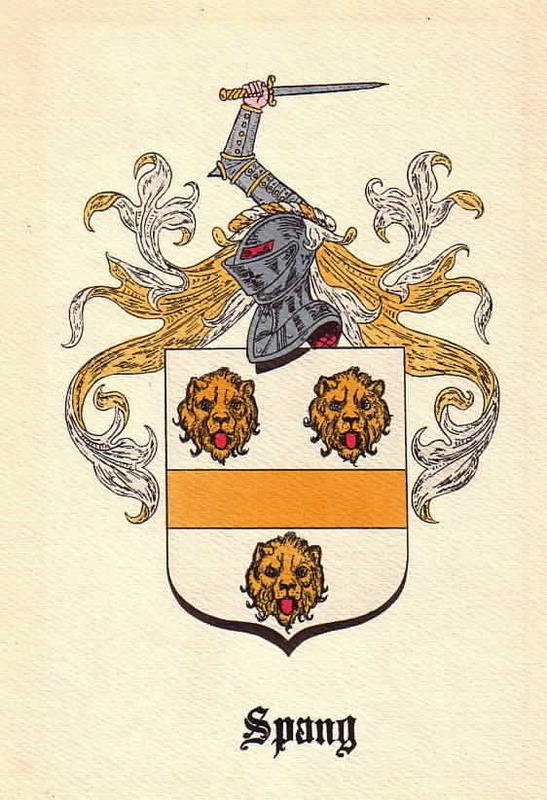 *There is some confusion about whether the name of Spang is entitled to a coat of arms in that it is an occupational name (old German for 'maker of shoe buckles'). This coat of arms has been in my family for at least 60 years so I have chosen to use it. November 4, 2013. My apologies for the site being inoperable so long. I have double checked all links and it seems to be ok now. Let me know if there are any difficulties.